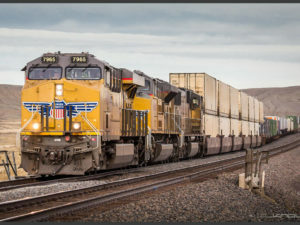 Union Pacific is boosting safety and efficiency with an approximately $48.1 million infrastructure investment in Utah this year. Projects funded by Union Pacific benefit Utah’s overall transportation infrastructure without taxpayer funds. $18.4 million investment in the rail line between Wells, Nevada, and Salt Lake City, Utah, to replace 146,327 railroad ties during a tie replacement project. $6.8 million investment in the rail line between Lynndyl and Tooele to replace 55,546 railroad ties during a tie replacement project. $2.6 million investment in the rail line between Ogden, Utah, and Granger, Wyoming, to replace more than 4 miles of curve rail. This year’s planned $48.1 million capital expenditure in Utah is part of an ongoing investment strategy. From 2012 to 2016, Union Pacific invested more than $221 million strengthening Utah’s transportation infrastructure. Union Pacific plans to spend $3.1 billion across its network this year. The company has invested $51 billion since 2000, contributing to a 40 percent decrease in derailments during the same time frame. Original article © Union Pacific.